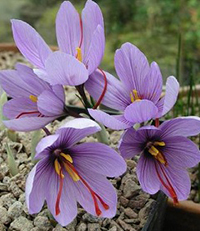 If you are interested in growing saffron crocus so that you can harvest your own saffron, you are not alone. Saffron spice is so expensive that many people have said it is worth its weight in gold and they often have wondered how difficult it is to grow. The short answer is, not that hard! The plant grows much like any other crocus. If you are interested in learning how to grow these plants for their delicious spice, keep reading! Before you rush out to purchase saffron crocus, there is something to consider. 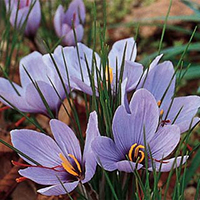 Saffron crocuses bloom in the fall, unlike many of their early spring counterparts. The "harvestable" portion of the plant is the red stigmas of the flower when it is in bloom. This is where the saffron spice comes from. One of the reasons saffron as a spice is so expensive is because of how little spice is harvested from any one plant. One bulb will produce just one flower, and each flower only will have three stigmas. For this reason it will require roughly 60 flowers to give you one tablespoon of usable spice. If that information isn't enough to scare you away from growing saffron, then continue on reading! The first thing you will need to do is find a source for dozens of saffron bulbs. Probably the easiest way is to go online and browse through different nurseries that specialize in flower bulbs. Saffron crocus bulbs are not all that hard to find, but they are not a common item that is typically found in the big box or chain stores. They are however readily available online. Saffron bulbs do not tolerate storage very well, so once you have them, you are going to want to get them in the ground quickly. The best time to purchase them is at the end of the summer season so they can be planted in the fall. A good rule of thumb for most bulb plants is you want to get them in the ground with at least 6 weeks of rooting time before the freezing temperatures arrive. Since the arrival of cold weather varies from region to region, you will need to determine for your area, when to order them and get them in the ground. Once planted you may seem some foliage start to grow before the winter, but don’t expect them to bloom the year in which they are planted. 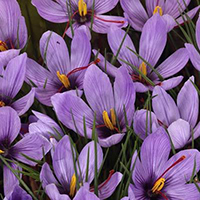 The following year however, you should have a nice first crop of saffron to begin harvesting. There is one word of caution that should be mentioned if you are going to start a flower bed with saffron crocus for cooking purposes. 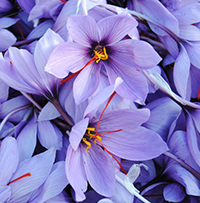 Many companies that sell crocus and other fall blooming bulbs are likely to also sell colchicums. 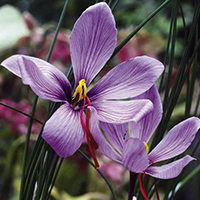 These are plants that are very similar to saffron crocus and they exhibit similar traits. They are commonly referred to as "autumn crocus". These plants are actually poisonous and are not to be confused with saffron crocus. Make sure you pay extra attention to the name of the plants you are ordering. Saffron crocus’s true name is Crocus sativus. The last thing you want to do is mix up a poisonous plant for one that you are planning on cooking with. Like most bulbs, saffron crocus bulbs are actually very easy to grow and do not need a lot of care to thrive in most gardens. Saffron bulbs will do best in a location that gets a lot of sunlight, and has good drainage. If the location you choose does not drain well and tends to stay wet for long periods of time, there is a good chance your saffron crocus will rot and die off. When you have chosen your location and are ready to plant, you only need to dig the bulbs down about 4 to 5 inches in the ground, and space them apart roughly 6 inches. Saffron crocus bulbs will multiply quickly in just a few short years, so make sure you give them ample space to spread out and in no time you will have quite the mass of flowers to harvest every fall. Saffron crocus bulbs are actually very hardy in regions where the winters do not drop below -15F. They do not require any special fertilizer, however if you must, do so just once a year. Saffron plants do not need a lot of water and in most cases normal rainfall amounts are plenty. However if you get less than an inch of rainfall per week, you will want to supplement them with regular watering until mother nature picks up the slack. The best time to harvest saffron is midmorning during a sunny day. Cut off just the flowers that have opened and leave the foliage on the plant so it can grow through until winter where it will then provide the plant with nutrients for the following year. Once you have harvested all of the flowers you can find, lay them out on a table and remove the red-orange stigmas. This is the only part of the flower that contains the saffron. The stronger the color of the stigma, the stronger the flavor the spice will have. You will need to find a way to dry out the saffron without using too high of a heat. If you have a dehydrator with a temperature control, you can use that on the lowest heat setting. You can also use a screen suspended in a warm, dry room that gets good air circulation. Once dried your saffron is ready to be stored and used at a future date.